Did I tell you we make a version of this EVERYSINGLEMONDAY? We make a version of this everysinglemonday. Sometimes Aaron coats the chicken with mustard and panko and bakes it. Sometimes we simply throw a little salt and pepper on ’em and pop ’em on the grill. And sometimes, we blacken. Today, we blacken. And I’m warning you now, the chicken might look a little burned, but that’s how you know you did it right! I think. I’ll be totally honest, the blackening spices vary from week to week. Just depends on what we have, what I grab, and what plummets to my head from the pantry door because toddler tornadoes. But this mixtchuh is right on right on, party people. It’s spicy, a little Mexi-happy, a teeeeeny bit floral, and all around on fleek. Okay, I just learned about this word, you guys. And I have yet to decide how I feel about it. Because when I say it I sound 85 years old. I guess I should backspace? Naw. The dressing! Ugh, it’s terrific. Don’t be nervous about a little raw egg yolk, either. I’ve been making Caesar dressing from scratch forever and there’s nothing wrong with me.wrong with me.wrong with me. What makes this particular version so spectacular is the amount of freshly grated parmesan cheese that goes in. A full 1/3 cup! Gah, maybe even more? I just grate and grate and sob and sob. The tubed anchovy paste is brilliant, as you won’t end up wasting 5/6ths of a little tin. You just squeeze a leetle, and put her away. Her = the tube of anchovy paste. Oh you got that? Oh. Burn, baby burn! I MEAN blacken, baby blacken! For real though, it tastes on fleek. Eck, I’m not so sure about this word. Should I be wearing a chain wallet when I say it? Anyway, long story long, make this! The dressing will slay you. 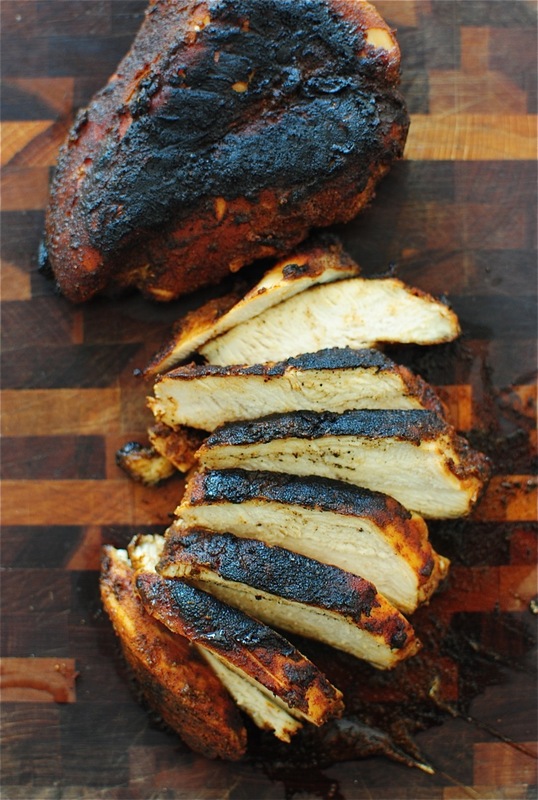 The spicy blackened chicken will kick you in the face. The cool, creamy avocado just adds that OOMPH. Shoot, add croutons if you want! I didn’t because I was lazy. But I will say one thing, this mess is on flee- nope. 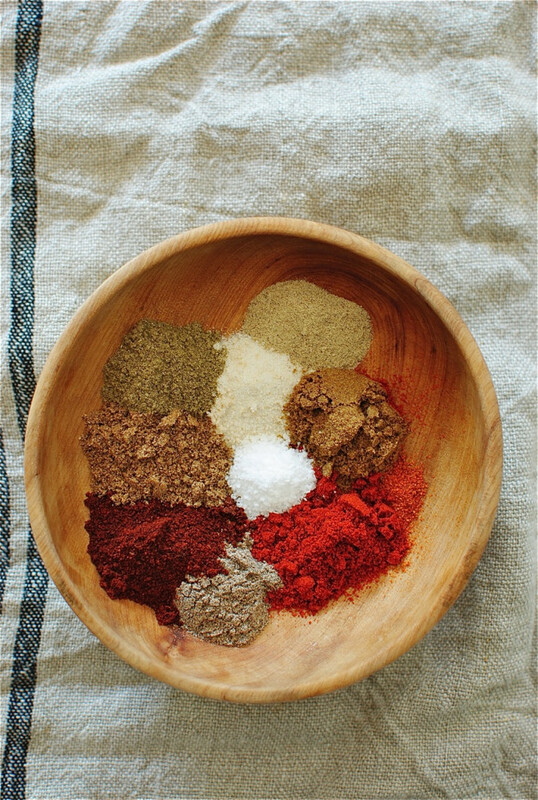 With your fingers, combine all the spices in a small bowl. Evenly rub all all over the chicken. Heat a Tbs. of olive oil in a sauté pan over medium-high. Place the chicken in the pan, cover and sear for four minutes. Flip and sear another four minutes. Remove from the pan and let rest for 10 minutes. Thinly slice. 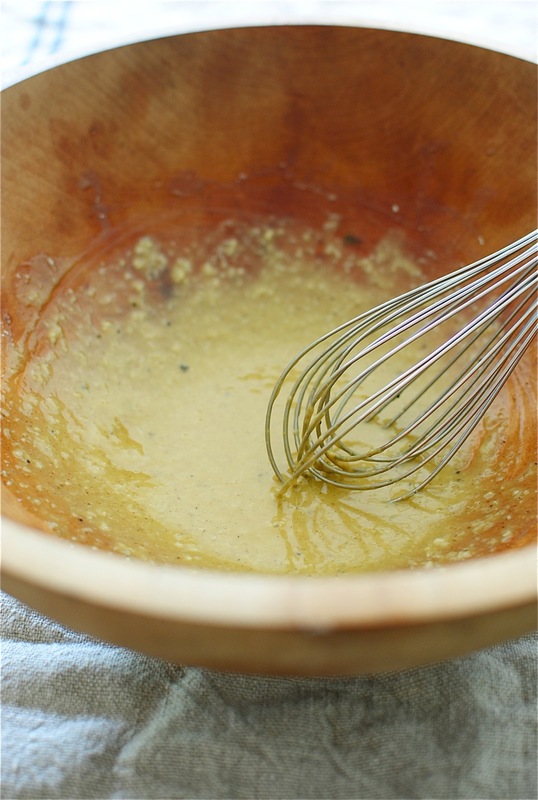 In the meantime, add the anchovy paste and lemon juice to a large wooden salad bowl. Whisk to combine. Add the egg yolk, worcestershire and mustard. Give it another good whisky whisk. Then add the parmesan and oil, salt and pepper. One fiiiiinal whisk to get it all creamy and emulsified. 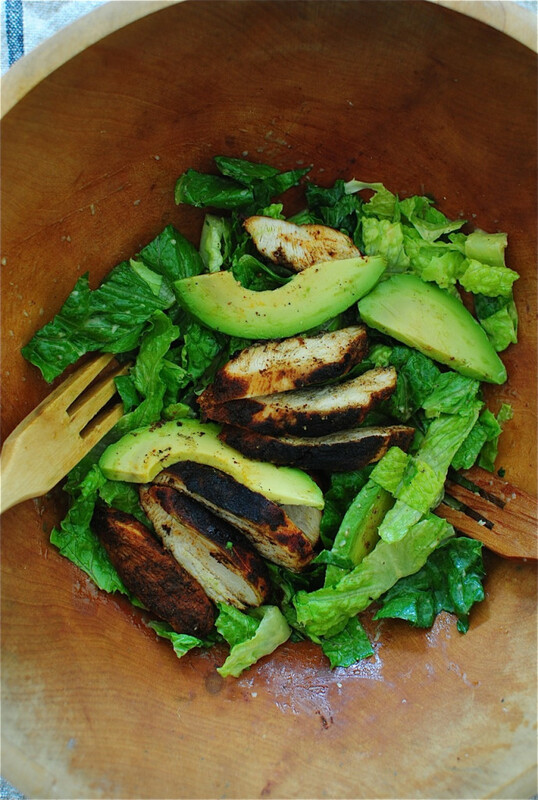 Add the chopped romaine to the salad bowl and toss to coat with the dressing. Add the sliced chicken to the salad and serve topped with sliced avocado and extra parm! Yum! These look delicious. Surprised you made a caeser without garlic! I know! I just never do. But you could definitely add it to the dressing! okay, this is going to sound SO un-foodie of me. but does blackened chicken taste burnt? I can't remember if I've ever had it! It looks DELISH but I'm trying to figure out if it should taste more like shake and bake or burnt or just overall flavorful. does any of that make sense? maybe I should just make it and answer my own questions. ignore me. It's not really BURNED burned, just a little char! Supposed to taste heavily spiced. Not really spicY, just spiced! But even if you get some charring, I love that taste. Like burned cheese, a little charring on meat. Mmmmmm. So delish. Hope you try it! That looks so good! Is there a pregnancy friendly way to make the dressing? Meaning no raw egg. Absolutely! Instead of a raw yolk, sub a little bit of mayo and cut down on the oil. Maybe a Tbs or two of mayo? And to thin it, a teeny bit more lemon juice. Let me know how it goes! 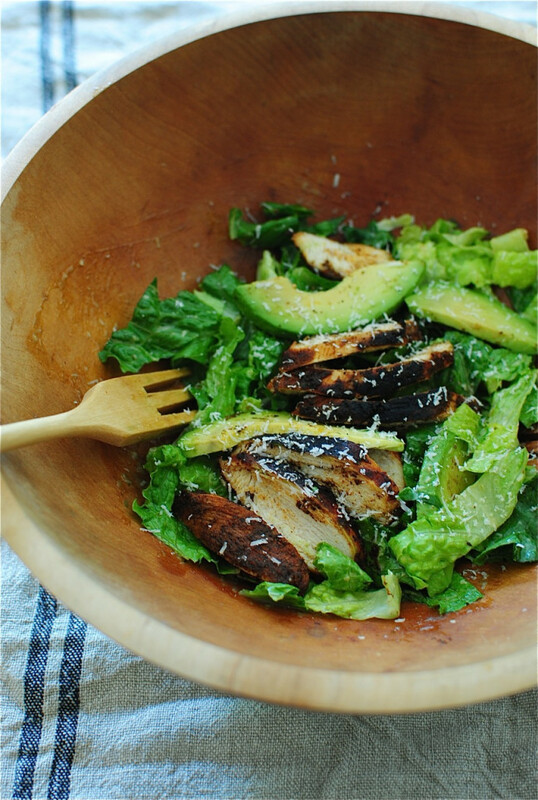 I made it with the mayo substitute and it was the best Caesar salad I've had! My husband loved it too! Thanks so much!! Exclamation! Do tell about the mustard and panko style chicken breast. How long to bake? covered? Yes yes! Okay, goes something like this: one bowl with an egg or two, a little bit of mustard, whatever spices you want. Dip the chicken in that, then dip into another bowl with panko. Place on a baking sheet, uncovered at 400 for about 20 minutes. Flip the chicken and go another 15 to 20, until the panko is golden brown! I made this tonight and it was superb! Home grown avos and lettuce just made it more special. Do yourselves a favour and make this. Thank you Bev. I'm so glad to hear! OMG, this is soooo on fleek = the most perfect meal EVA! 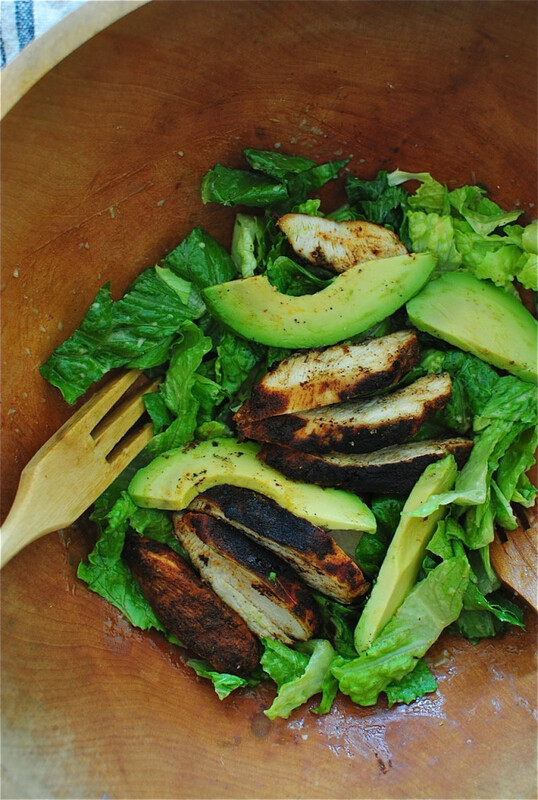 I had this last night & the combination of charred (so much flavor) chicken, avocado and the dressing, I die. I added croutons, because, whelp, I love carbs. Paired with a little Palencia Monarch Pinot Gris & wowza, there are no words. Hi, Bev - I'm curious as to where you purchase your anchovy paste. I'd rather not have to cut up fillets, but I can't seem to find paste in the average joe store. Any ideas? Thank ya! Hey, Vince! I actually find my anchovy paste right next to the tuna, canned salmon, sardines, right in there. Good luck! This was very flavorful. The blackened seasoning was very unlike anything we get down here in the Texas/Louisiana area, but very flavorful.